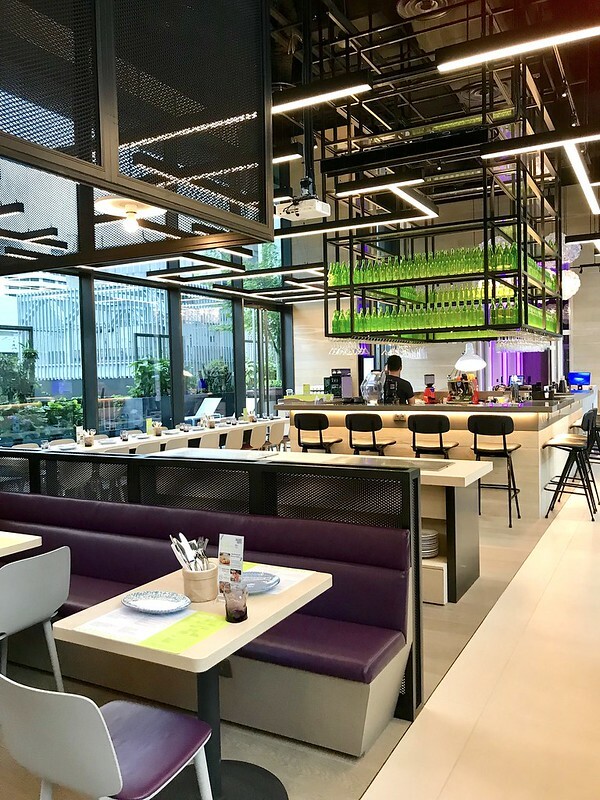 Grains & Hops is the all-day dining space at Yotel Singapore and offers nine signature Asian-style rice bowls topped with choices like grilled Angus beef, roasted Kurobuta pork collar, miso salmon and other seafood and vegetarian options. There are two Angus Beef options actually, grilled vs roasted. 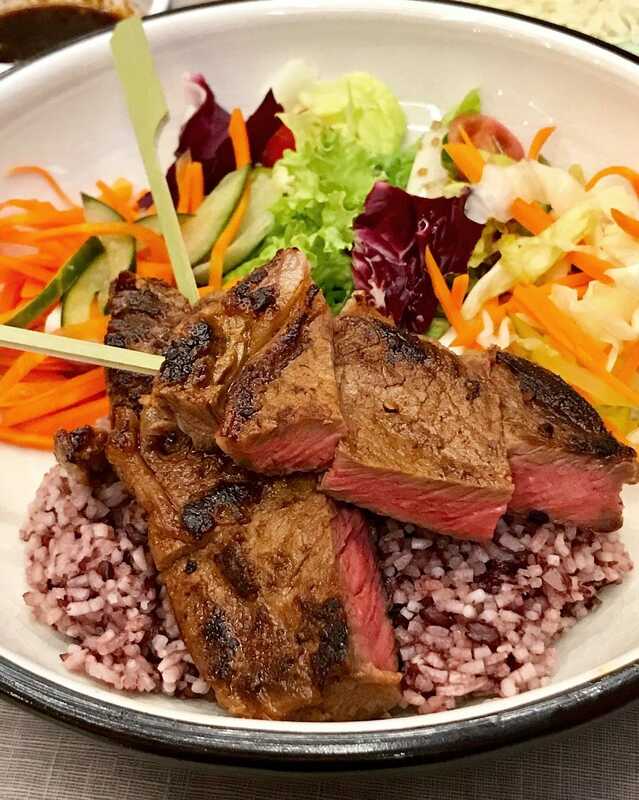 The Roasted Angus Beef (S$23, above) comes with skewered slabs (mine was done nicely medium), homemade spicy garlic sauce, signature purple sticky rice and a house salad. The grilled version (S$23) is served with multigrain rice, honey mustard dip and salad. 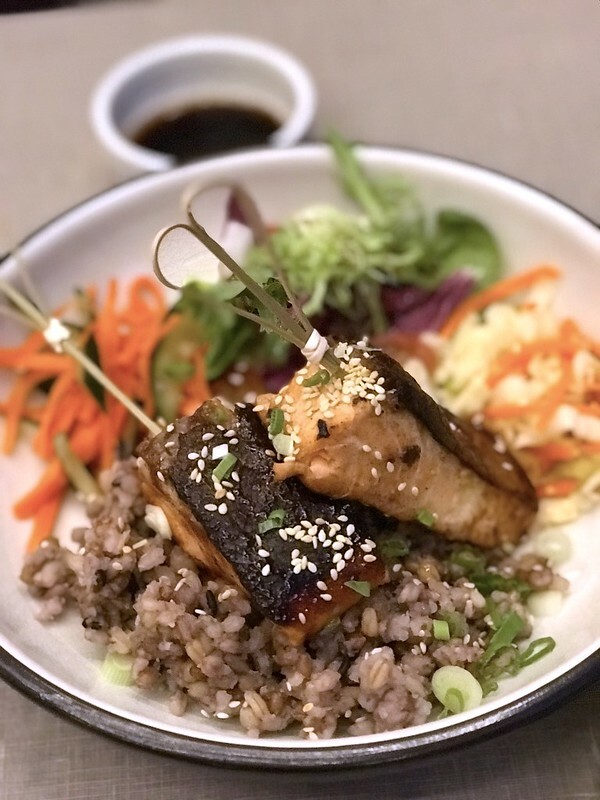 Grilled Miso Salmon (S$20) with teriyaki sauce on multigrain rice and plenty of salad. The salmon was a bit on the dry side but that's where the sauce comes in for the rescue. Roasted Chicken (S$15) skewers with basmati rice, homemade sambal mayo, and house salad. 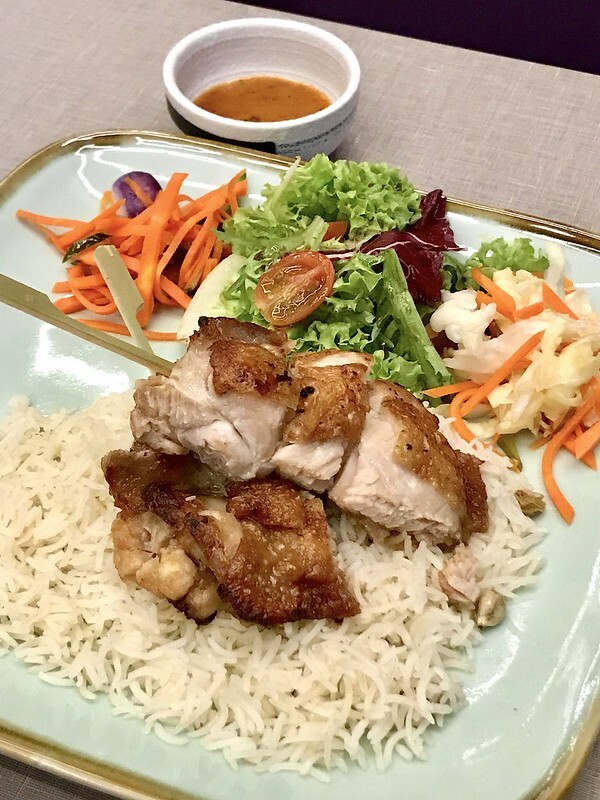 This was surprisingly good, with the basmati as an excellent choice for soaking up the chicken rice flavours. Right now there is a 1-for-1 promotion for this dish if you book on Chope. Book through the Chope app or website using the promo code CE1GH to get this offer. Last year I remember they did this for the Angus beef bowl. 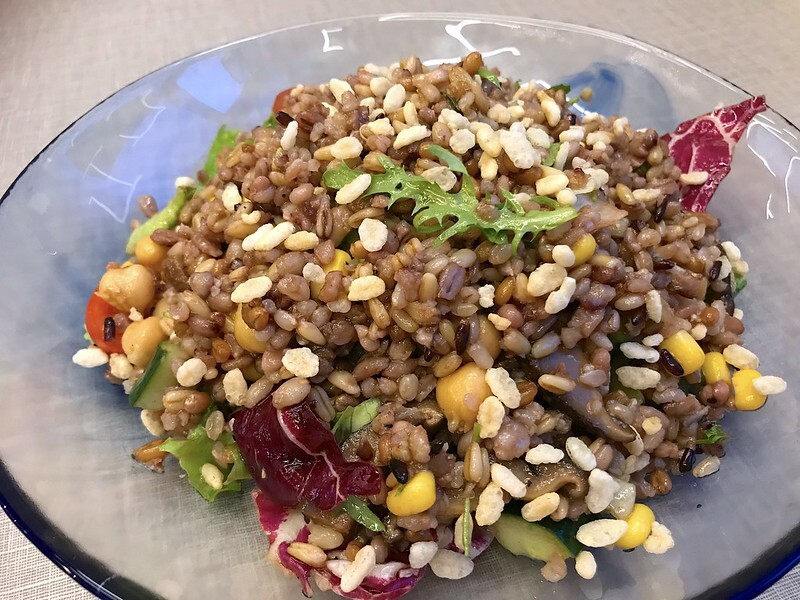 The Mixed Grain Spelt Salad with Marinated Mushrooms (S$11) could probably fill you up as a meal by itself. Barley, corn, chickpeas, cucumber, mushrooms and mixed grains are all brought together by an aged balsamic vinaigrette. I almost picked the Quinoa and Avocado Salad instead but spelt and mushrooms are a bit more unusual. 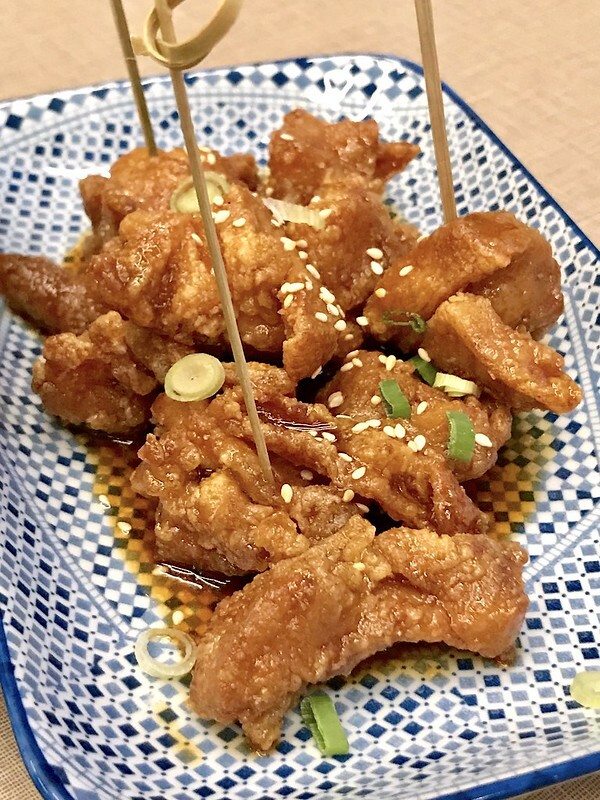 Marmite Chicken Pops (S$12) sound more fun than they taste. Somehow the bitterness of the Marmite is a jarring distraction, but hey it's still crispy fried chicken. Perhaps we should have gone for Ham & Cheese Arancini Dumplings but I thought that would be too much rice. 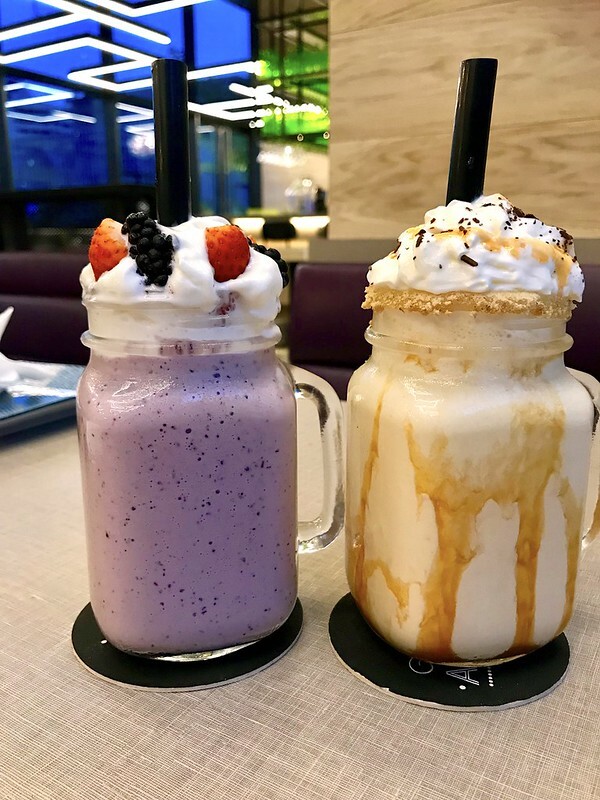 Grains & Hops does offer plenty of drink choices - craft beer, wines, cocktails, spirits, juices and even alcoholic and non-alcoholic milkshakes. We picked the non-boozy Salted Caramel (S$10) which was a deliciously sweet treat, and the Mixed Berries (S$9) which was just so-so. 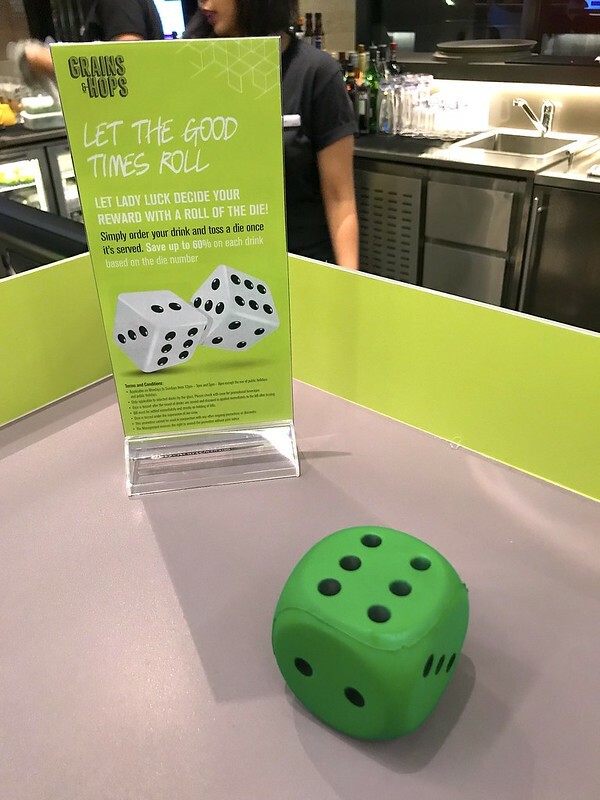 To make things fun, they have this "Roll your dice and win a discount on drinks" game. We rolled a six and got 60% off our drinks! Try your luck! This is a very likeable casual space. I like the spacious clean lines and vibrant colours. High ceilings are always a plus. They have private meeting rooms at the back of the restaurant too, as the restaurant is part of the hotel's Lounge at TEN communal area. Thanks to Yotel for the treat!